No More Pencils, No More Books, No More Students' dirty looks! The kids are out of school - so take 'em to see US this Summer! Thanks for another great School Year! We hope to see everyone again next year with our whole new program! Now as we gear up for our busiest summer ever, help us welcome our newest members of our team and check us out at many of your local libraries this Summer! 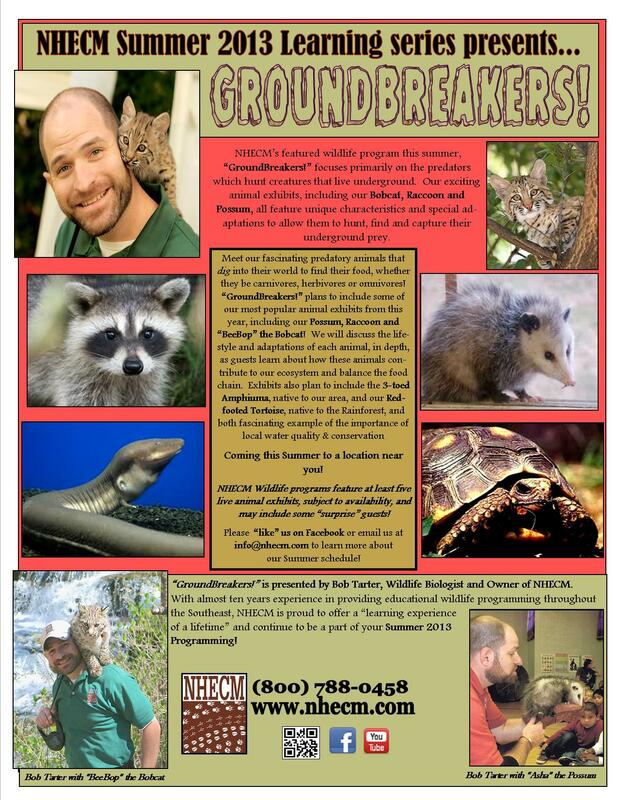 Our main program, "GroundBreakers!" (featuring "BeeBop") is only one of several we plan to present this Summer! Click here to for a "GroundBreakers!" flier! We are still booking for the Summer - so if you or someone you know are interested - CALL US TODAY! Mrs. McTigue, a twenty-year veteran art teacher in public schools, resides in Middle Tennessee with her husband and son and is a self-proclaimed "animal lover"! She's very excited to share this love for animals, art, and for educating today's youth, in our new program Secret Lairs developed just for "Dig Into Reading" this Summer. We feel lucky to have such a talented individual join our team and bring her special artistic skills into a new "spin" on our Summer wildlife education! 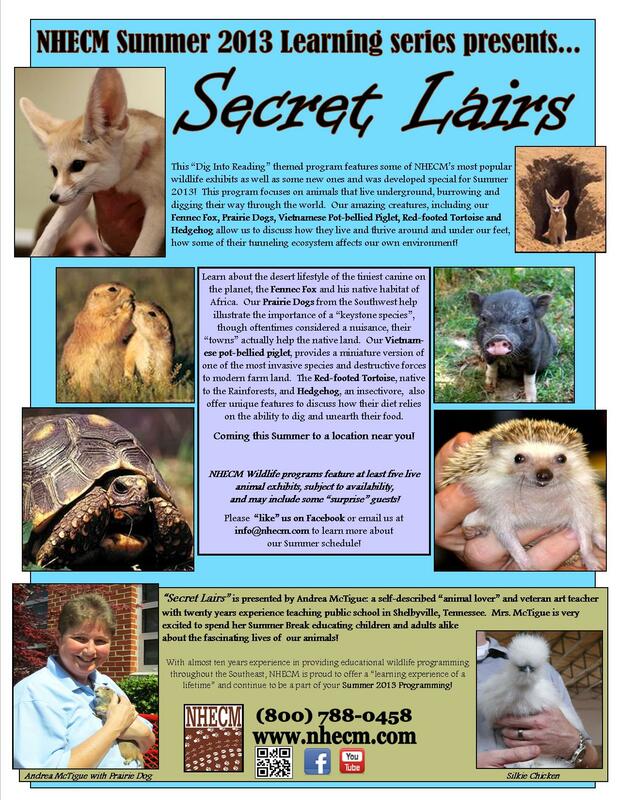 Click here for a "Secret Lairs" program flier! Josh Justice, a senior at UT Martin majoring in Wildlife Biology, has been working with reptiles for twenty-five years with an unparalleled interest and respect for these creatures. Oftentimes a misunderstood segment of the animal world, Josh already regularly conducts outreach programs educating local students about reptiles and the important role they play in our world. Josh lives in Northwest Tennessee with his wife and three sons and is excited to be a part of our Summer line-up! 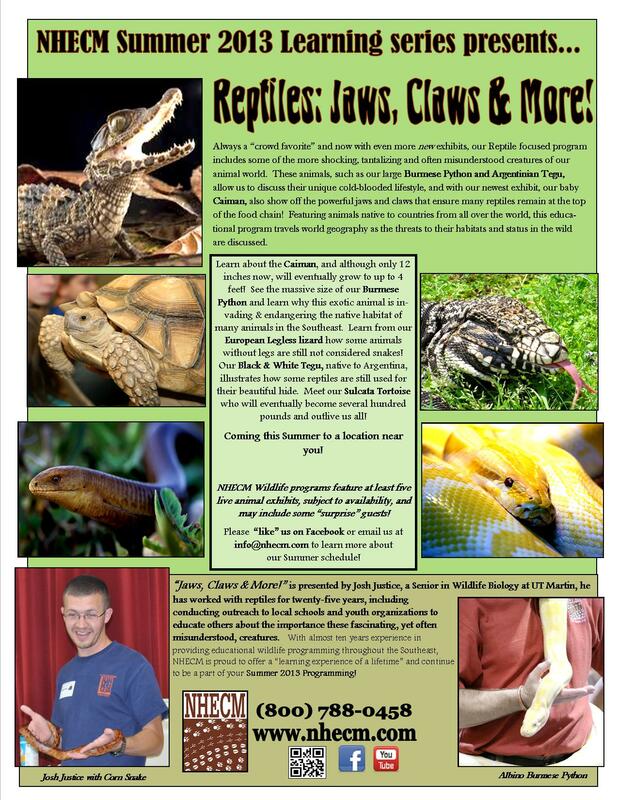 Click here for a Reptiles: Jaws, Claws & More flier! Wilson Bank & Trust "Family Fun Day"
"Reptiles: Jaws, Claws & More!" Copyright © 2013 NHECM: Natural History Educational Co. of the Midsouth, All rights reserved.